Our hotel is situated near the open-air bath in Berekfürdő, in the Tisza Lake region. 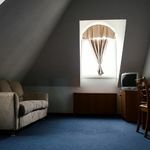 It has 36 double rooms, and 6 appartements /one for physically handicapped guests/, and the whole building is air-conditioned. In our rooms bathroom, television /with satellite channels/, minibar, telephone is at the disposal of the guests, who wish to recreate themselves and to be recovering. There is an internet corner with wireless network connection in the ground floor. The hotel has a spa. A surgery, electrotherapy treatments, under-water-massage, carbonic acid bath, medical and refreshing massage, mudpack, weight bath and sauna guarantee recovery. There is a thermal pool filled with 32 degrees water, a thermal poor filled with 36 degrees warm water and a swimming pool filled with 25 degrees warm water in the spa. An open-air bath with a swimming pool, a children pool and a Jacuzzi is in the hotel garden, they run from the 1st of May until the 30th of September. Hotel guests may use the spa, the Finnish sauna and the open-air bath free of charge. In our wellness centre 17 kinds of treatments serve for relaxation and refreshing. Max. capacity: 3 persons: 2 adults and child(ren) under 10. Max. capacity: 7 persons: 5 adults and child(ren) under 10. 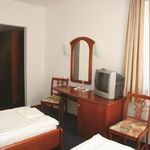 The rating of Thermál Hotel Szivek Berekfürdő is 8.9 from the maximum 10, 478 based on actual and valid guest ratings and reviews. "A szakács az első esti vacsorát /debreceni húsospalacsinta/ kissé túlméretezte, melyet képtelenség volt elfogyasztani! A Welnes részleg nem működött!" "A személyzet korrekt módon, udvariasan és segítőkészen állt rendelkezésre. Beszélgetni is tudtunk velük." "Das Personal war sehr freundlich. Wir haben das beste daraus gemacht." "Igénytelen, kissé lepukkant, nem figyelnek kellően a vendégekre, pl. Folyatosan hirdetik a csapolt sört, de nem volt. Az ágyak nagyonk kenyelmetlenek voltak.... ."